Martin Kaymer overcame a weather delay and a nervy finish to clinch a dramatic one-shot victory over Jim Furyk in the Players Championship at Sawgrass. Kaymer had held a three-shot lead on the 14th when play was suspended for 90 minutes because of a thunderstorm. The German double bogeyed the 15th but a superb curling 29-foot par putt on the 17th, and par on the last, saw him post a one-under 71 to win on 13 under. Furyk's closing 66 left him one clear of Sergio Garcia (70) in third. 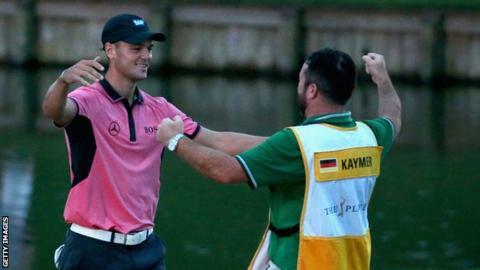 "On the last, Kaymer two-putted from off the front of the green to secure his first win since 2012. He has thrust himself back in the European Ryder Cup team picture and is the first player from the continent to win in America this year." England's Justin Rose shared fourth place with American Jordan Spieth, who had been joint overnight leader going into the final round. Rose had a two-shot penalty rescinded during the day following a review by the game's governing bodies and PGA Tour Commissioner Tim Finchem. Furyk had a par putt on the 18th when play was halted but the American returned to hole out. The former US Open champion watched on as German Kaymer wobbled before holding on to claim his win in near darkness and become only the fourth European to triumph in the tournament. "It's always very difficult to come back after a little break, you see the leaderboard, you see where you are," said Kaymer. "When you are playing the first 14 holes you are in it and just keep going. Then I made a couple of wrong decisions. "On 15 you give yourself a chance for par, you don't be that aggressive and try to go for it. And then on 16 you have to chip it, it was not the right decision but it was a big putt on 17. It feels like a major win." Kaymer holed the putt which ensured Europe retained the Ryder Cup in 2012 and is hoping his latest win can help him make the team for this year's staging. "I'm still a few points behind but I will do everything I can to make the team," he said. "It will be really nice to part of it again - once you've done it once you always want to be there."